A Google search for the term ‘VHS’ shows that we are not the only ones who have such fond memories of the video store. There are numerous fora devoted to video, such as the heavily populated Pre-Cert Forums, websites, Facebook groups and Twitter feeds. The popular auction website eBay has a high number of listings for VHS titles, with many reaching high prices. The cultural significance of the video shop is also demonstrated in film. The films of Kevin Smith have many references to the video shop, particularly the movie Clerks (1992), which highlight his experiences of working in a video store during his youth. Also, Quentin Tarantino’s similar experiences of working as a video store clerk prior to his rise to fame are demonstrated by the intertextual references found in all of his output. This experience has led to him being viewed as a cult film expert, his knowledge being drawn upon in the recent ‘Ozploitation’ documentary Not Quite Hollywood (Mark Hartley, 2008). Despite this clear cultural significance it is surprising that very little academic attention has been awarded to the video shop, and particularly video shop culture. Aside from studies into the economics of the video rental industry (Dana Jr. and Spier, 2001; Van der Veen and Venugopal, 2005), perhaps the most significant area of literature that makes mention of video shop culture is work that gives attention to the ‘video nasties’ moral panic in the United Kingdom during the mid 1980s. Kerekes and Slater’s (2000) exhaustive work See No Evil discusses the development of home video technology, the rise of the video shop and the subsequent trouble faced by video shop owners who rented the uncertified nasties. Similar works such as Barker (1984), Martin (1997) and Egan (2007) also award attention to the video rental shop during the moral panic but offer no detailed exploration of its cultural significance. The video cultures project intends to address this lack of academic enquiry into video shop culture. Firstly, we established this website using Posterous as the hub for all of our primary material. We selected this particular platform because of its ability to accept user contributions through email and its handling of multimedia attachments. As moderators we are then able to publish this material and any comments as they are received. Examples of user contributions thus far include a multi-media piece that discusses the disappearance of the video shop apprenticeship. Using the examples of directors Kevin Smith and Quentin Tarantino, the contributor interrogates how the video shop acts as an informal film school. Another contributor examines how the high street charity shop has become a repository for unwanted VHS tapes. Note the five comments from other contributors that engage in a debate around this issue. Another important contribution to the site has been a digital archive of scanned VHS artwork that was sent directly to us. These covers have been organised alphabetically and were published to the website in a daily series of posts. There are a number of publications that are devoted to video cover art, particularly those from the ‘video nasties’ and pre-certification era (Bryce, 2000 and 2001; Morris, Brewster and Fenton, 2005; Wingrove and Morris, 2009). This demonstrates the cultural significance of video cover art and this has been reflected in the video cultures website. We also connected a Twitter account to the Video Cultures website so that all material published to the website would automatically be posted to Twitter. This has helped to establish a community of followers interested in video culture. Through Twitter we are also able to call for contributions and have conversations with these individuals. At the time of writing, the Twitter account has 232 followers, several of whom have submitted written material and multimedia content to the Video Cultures website. A search for the word ‘VHS’ on Twitter reveals that at any given moment people are publishing their memories and/or feelings about video culture. Through a process known as ‘retweeting’ (republishing the Tweets of others that are relevant or interesting) we are able to draw on similar conversations and discussions already occurring on Twitter and incorporate them into our research. Here as an example of a Tweet that was recently retweeted by us. It demonstrates the nostalgia that surrounds videotapes and the emotional resonance that they can possess. As a short case study, it is worth unpacking some of the issues that are raised out of this video interview. One of the earliest words used by Dale in the video is ‘nostalgia’. The VHS tape reminds Dale of his youth, a carefree time in his life when he was discovering his tastes and interests in the company of friends. 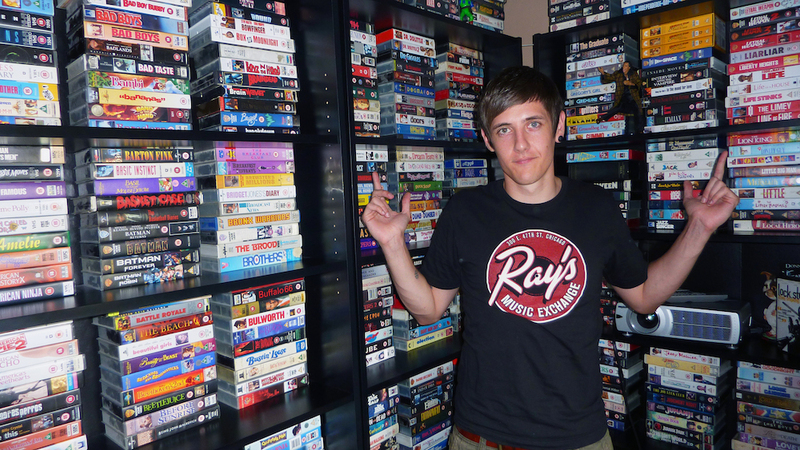 For Dale, the Friday night ritual of renting tapes from a local video shop still seems ‘incredible’. Given his age at the time he was actively renting videotapes, it is likely that Dale was legally too young to watch the sort of explicit horror entertainment that he was frequently seeking out. There is a sense that the exhilaration of breaking the rules has contributed to Dale’s fond memories of locating and viewing this sort of adult content. Dale has clearly spent long periods of time searching for particular films, researching the details of their production (cast, crew, production companies and video labels) and has become an expert in a small but significant strand of popular culture. His authority in this area is also a key part of how he is empowered by his fandom. Another interesting aspect of Dale’s commentary is the notion of authenticity. Dale tends to collect VHS tapes that represent the first issue of a film in the VHS format. For Dale, the VHS tape is an original artefact from a bygone era and by owning the ‘original’ tape, Dale recaptures an essence of the excitement he felt during that time period. Dale views modern day products as ‘disposable’ and lacking in the sorts of production values (sturdy cases, vivid art work printed on heavy paper) associated with the vintage media that he collects. Dale favours the so-called ‘soft cases’, which are larger and protect the tapes more effectively. It is not the technical advances of new products, such as improved picture quality, scene selection options, audio commentaries or other bonus features, offered by DVD and Blu-ray, that Dale covets. Rather, it is the rarity of the obsolete object and the emotional attachment he has to them that makes them desirable. Dale is aware of the popularity of pre-cert tapes, which have become increasingly valuable as collectors items and he factors these criteria into his purchases. 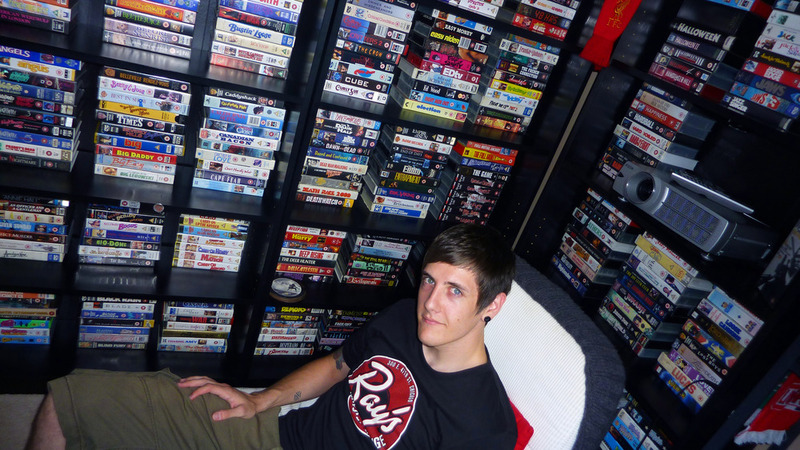 Although Dale own and enjoys DVD and Blu-Ray releases, it is finding, buying and owning specific VHS cassettes that Dale describes as his ‘main priority’. As a further expression of his videotape fandom, Dale used to run a weekly quiz on Twitter for which he uploaded an image of a word that had been constructed from letters taken from VHS art work. Film aficionados from all over the world took part in the quiz, guessing the films based on their memories of the individual fonts that were used in the video cover art. The response was so great that Dale no longer has time to administer the quiz. Evidently, there is a large community of films fans online who have strong memories of the artwork associated with the sort of low budget genre movies that were produced during the 1980s and are also engaged with the VHS cassette tape as a signifier of these memories. In this article we have outlined the early stages of the Video Cultures research project and our methods for gathering primary material. The material that has been collated thus far, such as the interview with Dale Lloyd, shows that there are a number of interesting strands that are worthy of further investigation. For example, the distinction between the VHS tape as a desirable object, the shop as a space and the rituals that surround renting and the impact of digital culture on collectors of VHS tapes. We welcome contributions to the video cultures website by email at videocultures@gmail.com. Barker, M (1984) The Video Nasties, London: Pluto Press. Bryce, A (2000) Video Nasties, Devon: Stray Cat Publishing. Bryce, A (2001) Video Nasties 2, Devon: Stray Cat Publishing. Brewster, F Fenton, H and Morris, M (2005) Shock Horror!, Surrey: FAB Press. Dana Jr, J.D. and Spier, K.E (2001) Revenue Sharing and Vertical Control in the Video Rental Industry, The Journal of Industrial Economics, 49(3), pp223-245. Egan, K (2007) Trash or Treasure? : Censorship and the Changing Meanings of the Video Nasties, Manchester: Manchester University Press. Kerekes, D and Slater, D (2000) See No Evil: Banned Films and Video Controversy, Manchester: Headpress. Martin, J (1997) Seduction of the Gullible, Nottingham: Procustes Press. Van der Veen, J.A.A and Venugopal, V (2005) Using revenue sharing to create win– win in the video rental supply chain, Journal of the Operational Research Society, 56(7), pp757-762. Wingrove, N and Morris, M (2009) The Art of the Nasty, Surrey: FAB Press.